RIFT news tidbits for 2nd July 2015. PTS Update for 1st July 2015. PTS was updated yesterday with a large 1.9GB patch. Includes Nightmare Saga quests, Planetouched Wilds quests, chronicle randoms, Tarken Glacier IAs and a ton of other stuff. Check out full info/screens here! 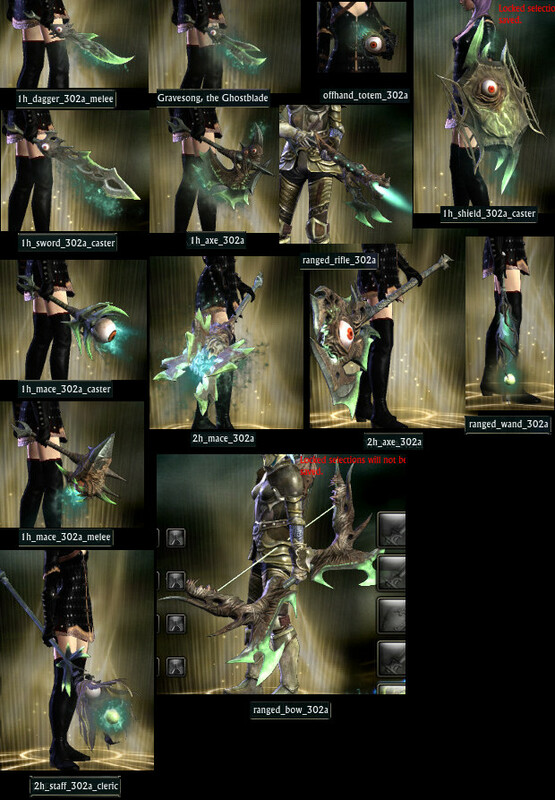 Nightmare Saga Weapon Models. New weapon models have popped up on the PTS that are likely rewarded during the upcoming Nightmare Saga. [image] They are similar to Ultimate Nightmare Pack weapon models, except they are larger with extra green spikes and prominent green glow. Just like Levitate mount, but with glowing hands and feet. Chloro PvP Fix. Red Hawk has a fix in for some bugged out Chloro LBV procs in next PTS build. Will also take a look at Synthesis’ interaction with synergy crystal. Contemplating changing it so that flat value changes will be multiplied by PvP healing reduction penalty before being applied to heals. [r] (in short, a nerf to chloro healing in PvP). ELO Accuracy. CM Ocho explains that the ELO system is quite accurate and is the no.1 predictor of a team winning a match, even in warfronts with premades. Inactivity (no. of players afking in the warfront) was a close second to predicting a win. More info here! Ms Meles = 12 Life 12 Death 12 Hunting 12 Harvesting 30 Stamina. RIFT Update 3.3 – New Dimension Keys & Items Preview [Video][Dimensions]. Nouvae over at The Dimension Gallery has uploaded a fantastic preview video of all the dimension keys, sky projectors and other dimension items that are coming to RIFT in Patch 3.3: Waking Nightmares. Check out the video here and be sure to subscribe and check out her other dimension showcase videos on her YT channel here! RIFT 3.2 – Full Warfront Series EP3: Karthan Ridge [Video][PvP]. Gokhan@Brisesol plays a Rogue Bard spec in the Karthan Ridge warfront in his latest pvp video. Check it out here! the artifacts of PTW are in the pts too. Oo, nice find mycopanther! It seems some of them might be important NPCs and/or locations/cities in PTW! The main PTW artifact set reveals other sets like: Sky Leviathans, King Khar, Shal Korva, Jad, Zal Shulam, Usukhel, Shalistiri and Callweddi! I am so impressed with everything coming our way for 3.3 and eventually 3.4! The amount of love and attention to the players from the Devs is outstanding lately, and I can’t say enough good things, this is going to be a great year for RIFT. Great video Nouvae! Stuff like dimension keys/projectors really needs a video. Images just can’t capture them.